ugh it was the same way in Europe!!! tiny portions for more money. And in spain i remember a Texican burger at BK. I took pics of the steakhouse burger when I was there compared to the steakhouse burger in the states... so much smaller. Shouldn't there be a uniformity so that if you travel internationally you can expect the same thing of a chain? Dang, I wanted to try new Texas this week, seeing your pic just turned me off. Why can't Mos Burger do a chili burger?!? Oh man, that would be good. Love Mos Burger. Same here David. Was looking forward to it - now not so much. Had Mos for lunch today and it didn't quite fill me up. But Blue, your picture does still look... edible. Maybe I'll try it anyway haha. 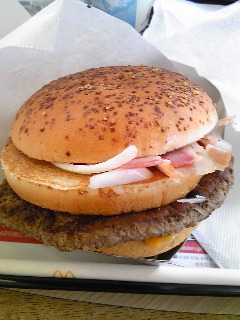 Damn you, Mickey D's Japan for offering a new burger often enough to make me keep trying these damn things and hacking away at the back end of my life span. Peter - Yeah, it was...edible. Bill - I know! I don't eat fast food that often, but sometimes thee novelty items are too much. Xamuel - Heh heh...agreed. I always get a set and an extra burger when I go to Mos. I tried the "Texas 2" and the burger I was given looked like the photo in ad...not at all like what you received. And it was quite good. Much better than last year's "Texas Burger" was. John - would like to try that, but none in my area that I'm aware of! T5 - Guess next time I need to go to different shop and see if the quality's any better.